When it comes to rewards card, there are many reasons to keep multiple credit cards in your wallet. But in my opinion, there is one that’s most important to keep The Platinum Card® from American Express in my wallet. In this post I’ll share 5 reasons I got the platinum card (and why it stays in my wallet). I always use The Platinum Card® from American Express $200 statement credit on airline incidentals. Each year cardholders can receive receive up to $200 a year in statement credits when incidental fees are charged by the airline to card account. You must select your preferred airline when you receive the card and your credit will be applied for qualifying charges related to that airline. You must select your airline, so do that first, otherwise the charges won’t be credited. Once you select you can use the credit on a number of incidental fees for the airline like baggage charges, add-ons, etc. 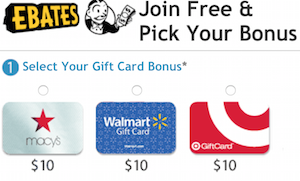 Some reports indicate that gift card purchases qualify, but your miles may vary. Here are the full details of the $200 statement credit. Statement Credits: Incidental air travel fees must be charged to the Card Member on the eligible Card Account for the benefit to apply. Purchases made by both the Basic and Additional Card Members on the eligible Card Account are eligible for statement credits. However, each Card Account is eligible for up to a total of $200 per calendar year in statement credits across all Cards on the Account. The card comes with complimentary Hilton Gold Status which you can read more about here. It also comes with complimentary Starwood Gold Status. These status levels can get you cool benefits like upgrades, complimentary wifi and others when staying at eligible hotels. Here are the details of the Hilton Gold Status. Here are the details of the SPG Gold status. As a Platinum Card® Member or Business Platinum Card® Member you are eligible to enroll in complimentary Starwood Preferred Guest® (SPG ®) Gold Preferred Guest status. Once you request enrollment within the Starwood Preferred Guest Program at Gold level, American Express will share your enrollment information with Starwood Hotels & Resorts Worldwide, Inc. (“Starwood”). Starwood may use this information in accordance with its privacy statement available at spg. You will maintain Gold Preferred Guest status without meeting otherwise required SPG Program criteria as long as you remain an eligible American Express Card Member or until American Express notifies you that the benefit is terminated. Cardholders also gain access to the exclusive Centurion Lounges at airports. In addition, Priority Pass Select offering access to over 600 domestic and international airport lounges. Here are the details of the Centurion Lounge benefit. Platinum Card Members have unlimited complimentary access to all locations of The Centurion Lounge. Gold Card and Green Card Additional Cards on your Platinum Card account are not eligible for complimentary access. Card Members may bring up to two (2) companions into The Centurion Lounge. Cardholders will receive a statement credit every 5 years after you apply for Global Entry ($100) or TSA Pre✓ ($85) with an eligible Platinum Card From American Express. If approved, you can get expedited screening at select airports. If approved for Global Entry, at no additional charge, you will receive access to TSA Pre✓. Each Additional Card on eligible Card accounts is also eligible for one statement credit every 5 years for an application fee. To receive the statement credit, the application fee must be charged on the eligible Additional Card. The benefit is available to (i) Corporate Gold Card Members, (ii) Consumer Platinum Card® Members, Corporate Platinum Card® Members and Business Platinum Card® Members, and (iii) Centurion® Card Members. The benefit is also available to Additional Platinum and Centurion Card Members on eligible Consumer and Business Card accounts. To receive the statement credit, Additional Platinum and Centurion Card Members must charge the application fee to the eligible Additional Card account. Card Members are eligible to receive statement credit every 4 years for the application fee for either Global Entry or TSA Pre✓® when charged to an eligible Card. Card Members will receive a statement credit for the first program (either Global Entry or TSA Pre✓® ) to which they apply and pay for with their eligible Card regardless of whether they are approved for Global Entry or TSA Pre✓®. 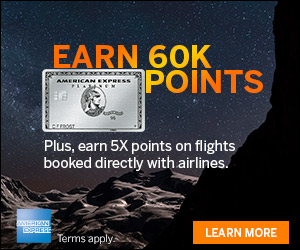 Cardholders can earn a whopping 5x bonus on eligible flights and hotels booked directly with American Express. These can add up, especially if you travel several times a year. 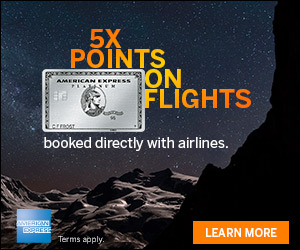 Read more here, 5x Points On Airfare With Amex Platinum Card/s. The Platinum card is loaded with a bunch of perks and has a great offer, making it a great card to get. The ones above at the top 5 reasons I got the Platinum American Express Card. If you don’t already have the The Platinum Card® from American Express, consider the benefits above and if the card makes a good addition to your wallet. You can apply for the card here. Companion ticket? Do you mean the extortionate unrestricted F fares? The benefits aren’t bad at all but SPG Gold is almost meaningless.